Paysafecard allows you to make deposits into your Cozino account anytime. It is safe, easy, and anonymous. Paysafecards are available in many different places, petrol stations, newspaper kiosks, electronic stores, post offices, book stores, banks and many more. It is quick, easy and safe. You don't need a credit card or a bank account. By choosing Paysafecard you'll be getting the safest, simplest solution going: that's because Paysafecard is a prepaid card that lets you pay on the internet. 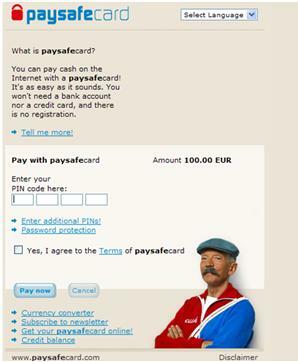 Paysafecards can be purchased at values of 10, 25, 50, and 100 EUR. If the grand total of your payments exceeds your card credit, you can easily pay the remaining debit using the next Paysafecard. For a single payment, you can combine up to ten Paysafecard which allows you to use up a residual credit on your current Paysafecard. Paysafecard is every bit as simple as cash. You don't need a bank account or a credit card. That's because Paysafecard is a prepaid voucher that you can buy from local shops and use to pay for online transactions on the internet. To make a deposit using your Paysafecard you need to select Paysafecard from the payment options, enter the amount in Euros and your bonus code (if you have one).